The great Armenian-Egyptian painter Chant Avedissian is famous for his colourful depictions of Egypt’s most iconic personalities. None more so than the legendary Umm Khultum. 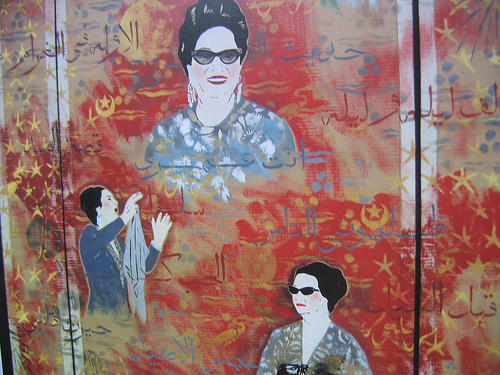 Avedissian colourfully immortalised her signature beehive and jewel dotted black sunshades in his work Umm Khultum’s greatest hits and for anyone who views it, the painting exudes the mysteriousness of Egypt’s most famous songstress. No one can tell the story of Egypt in the 20th century without mentioning Umm Khultum. She led the epitome of a public life and to an outsider she was a cross between Billie Holiday and Eva Peron. She considered herself a champion of the poor, who managed to transition smoothly through each of Egypt’s historic upheavals. She was close to both King Farouk and later Gamal Abdel Nasser. Charles de Gaulle even referred to her as “The Lady”. Today, almost forty years after her death, her star power shows no signs of waning. Her songs still sell in the millions every year and millions more fall in love with her unique sound, as she conjures up memories of a time when the Arab world was experiencing a cultural rebirth. Umm Khultum was born in 1904 in the town of El Senbellawein in the Nile Delta. There is some debate over the accuracy of the year, as some say it was six years earlier. However as a young girl, Khultum was known for being both intelligent and engaging. Her parents had enrolled her in a Quranic school, at a time when it was still rare for girls to be educated. In addition to her academic achievements, Khultum was known as having an excellent singing voice. It was through the assistance of her open-minded father, who was also an imam, that Khultum was encouraged to develop her talents further. She would sing at parties and local gatherings, but she would dress as a boy in order to avoid harassment by drunken revelers. Her singing career took off during the 1920s after she moved to Cairo and began to sing at working class venues with her father and siblings. In the capital, she promoted herself as an actress and made her first movie in 1935 called “Widad”. As her following grew, she worked with different poets and musicians, and adapted songs to deliver them in her own unique way. She collaborated with the likes of Ahmad Rami and Mahmud Bayram el-Tunsi, and worked to perfect the vocal style of music called ‘tarab’, which induces a soothing, but also haunting feeling in those who hear it. Her most famous songs include: “Inta Omri” (You are my life) and “Leilat Hub” (Night of love). She performed every month and audiences would swell into the thousands. From Morocco to as far away as Iran, Khultum’s voice proved to be extremely popular. She became known as Kawkab al-Sharq or ‘star of the east’. In Egypt itself, her success was also down to the fact that she was considered an authentic Arab singer, who had no need of imitiating western styles of performance. Khultum was also unabashedly pan-Arab in how she marketed herself. Her songs reflected her staunch loyalty and devotion to her homeland. No subject was too prosaic to sing about. She even found a reason to put pen to paper and sing about the construction of the Aswan Dam. She undertook numerous charitable projects, which sealed her place in the hearts of Egyptians and by extension the rest of the Arab world. In the aftermath of Egypt´s defeat in the 1967 war, Khultum went on tour to raise money for Egyptian veterans. The needs of the people were always a top priority. What makes Khultum truly extraordinary is the way she shrewdly managed her career. She was a master of PR and she knew how to be photographed, when and where, and in what outfit. She could generate publicity at the most effective moment. She could teach many of her contemporaries about how one can achieve longevity in the tricky world of show business. Her legacy has inspired artists such as the Iranian filmmaker Shirin Neshat to travel to Cairo to make a movie about her life and Israeli singers such as Sarit Hadad have covered Khultum’s songs. When she died of heart failure in 1975, Khultum’s funeral attracted an estimated four million people. Later her house on the Cairene island of Zamalek was destroyed in the early 1980s, but in its place a statue of the Khultum was erected. Today in Cairo, there are still many cafes and restaurants named after her. It would be interesting to know, if she were still alive, what Khultum would think or rather sing about Egypt today? How would she express the chaos that has engulfed her county in the past few years? How would she address the confusion and disorder that grips the lives of her fellow countrymen and women? How would she react to the grinding poverty, the growing religious fanaticism, the military’s brutal response to opposition elements, and the flight of capital? It leads one to ask, what has happened to Khultum’s Egypt? Whatever has happened, there are millions of Egyptians and Arabs who don`t wish to see what she stood for being lost in a cultural time capsule. There is a desire among many Egyptians who hope to see their country once again become a font of cultural achievements and a place where artistic freedom will be accommodated. Umm Khultum is a symbol of hope and a reminder of what can still be. Em, I love your articles so much. Erudite, the perfect length and so illuminating. Thank you for the effort you put into this. You must find a way to channel it and get greater recognition for being such a polymath. Lots of love and please move to Dubai. The desert flower is blooming again!